The product range of special buys 7 is larger for 16 February this week. But visit Aldi stores for kids' bedroom products, and storybooks on 13 February. Quite a nice deal on many books and stories are available on kids' share of the catalogue. Also, see toys, puzzles, activity books, and more. Are your kids so bored all the time? They might need a change in their living zone. Most kids love to play outside and video games, however, some might want to just stay in their bedroom minding their own business. Let them choose the colours, design and customize their room with their own taste. 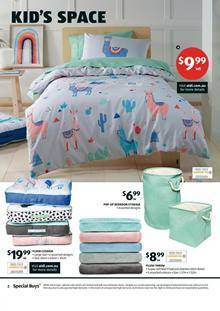 You can show your kids pg 2-3 of the latest Aldi Catalogue which is a preview for Special Buys Week 7. Sheet sets, quilt covers, floor cushion, and many more products are on sale this week. Visit stores of Aldi on Wednesday for the best deals. Also, check out Aldi Special Buys Week 6 for the Saturday deals. Tomorrow might be a profitable day to shop for outdoor products.